buildlog.net • View topic - Modding a cheap 'NEJE DK-8-KZ' with new board and laser. Modding a cheap 'NEJE DK-8-KZ' with new board and laser. Writing from Sweden, this is my very first post on this forum! I hope its in the right place since i plan to document this build. Worth mentioning is that i am completely new to Laser engraving and the machines used for it, what i want is a very small desktop size GRBL laser machine to work on rings and other smaller projects. 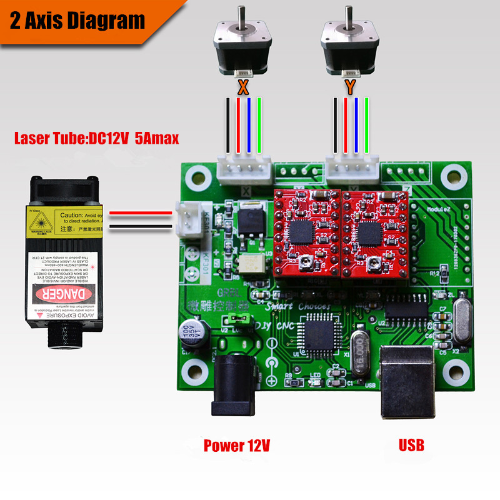 I saw the cheap 'NEJE' units and like the form factor, thought maybe its possible to mod one into a higher power machine with a 2.5w - 5W true power laser, so i searched boards and lasers to the best of my very limited knowledge about these things..
Found one 2 axis board that is 5v like the original board and has GRBL, it would run the cd-rom stepper motors, laser and everything fine, but only support a laser up to 1500mw, i need a more powerful laser.. So i had a thought, and keep in mind i know nothing about this stuff.. but what if i connect a 12V higher power laser via the TTL port on the driver to the laser port on the 5V board, and run the laser via its own 12V power supply, could this work or is it the most stupid thing you ever hear?.. Another possible option is a perfect size 12v 2 axis board, that would solve everything! except for the cd-rom stepper motors that i hear run to hot when supplied with 12V, or could it work? if not how can i fix so the motors only get 5V? This is the 12V board. Re: Modding a cheap 'NEJE DK-8-KZ' with new board and laser. Spend a little more and buy a machine not based on repurposed CD/DVD drive mechanisms... IMO the NEJE is a toy an not worth spending time and money on upgrading. A more powerful laser will be heavier? If so, you may run into problems moving the laser around in a precise manner. As for the steppers 12V should not be a problem if the drivers can be adjusted to supply current to the motors that is within their spec.